Be sure to let me know what you think I should keep in the comment section! These jeans were really comfortable and fit pretty well. I loved how dark they were as well and they felt like nice, high-quality jeans. Unfortunately, they seemed a little short to me (you can see that they're too short in the picture below) and I can't justify spending almost $100 on jeans when I just bought two pairs! Then again, can you really ever have too many jeans? I really like this sweater! It's super cozy and warm. I also love how it's oversized, but not too huge on me. I had a similar sweater a few years ago that I loved, so I know that I would get use out of this. I'm still deciding on this since it's a little more expensive than I'd like to spend. What do you think? I really wanted to like this sweater- I love the chunky knit and it seemed like the perfect fall sweater! However, it looked really shapeless on me, the sleeves look too short for my arms, and the elbow patch was way above my elbow. This is a really pretty scarf that has a subtle bird print all over (as you can see below). I loved how this looked paired with a plain white tee and jeans - instant style! The material is really soft and I love how oversized it is. Perfect for those chilly fall days! This was definitely one of my favorite boxes yet! Everything definitely fit my style and I could see myself keeping (almost) every piece. With Stitchfix, you get a 25% discount for buying all five items. For me, this would bring the price of my box down to $214. Not too bad! What do you think? What should I keep? I haven't tried Stitch Fix mainly because I like shopping for my own clothes and always think I wont like what they pick. But, lately I can't seem to find a darn thing in the stores so maybe I should give it a try! I hate the new style of shapeless and boxy, I always look so lost in those cuts and they do nothing for me either. I really need new fall clothes! Those jeans would be perfect for you if they weren't too short! I haven't done the Stitch Fix thing either, mainly because I'm a serious bargain hunter when it comes to clothes/shoes, and I also like to get pieces that remind me of trips or places when I do decide to pay "regular" price for clothes, e.g. my lopapeysa from Iceland. :) I LOVE that scarf, though!!! Definitely a keeper! The knit top is very cute. It’s still warm here, but I need to start buying long-sleeve shirts to replenish my winter collection. I had to weed out some old tops when spring sprung. Love it all, but the first wo are my favourites: jeans and cardigan. LOVE them. Stitchfix doesn't deliver to Canada - so nope, haven't tried it! That's too bad, but probably good for your wallet ;) Thanks Rebecca! oooh i LOVE the cardi! super cute. also, the sweater is cute as well, but definitely too short. hate when that happens! Same here :( Although it makes it easier to send back! I've tried StitchFix a few times and have kept 1 or 2 things each time but feel like they aren't really paying attention to my feedback/requests which is a little frustrating. I love the cardigan! Looks so cozy. Adding a scarf is one of my favorite tricks to spruce up a basic outfit. Looking forward to breaking out my scarf collection now that it's fall! Gretchen, LOVE that sweater on you!! I don't recognize any of the brands-how is the quality of the clothing? I love the cardigan! So cute and comfy! It's pretty good! A little overpriced but not terrible quality (like forever 21). More similar to JCrew. Everything I've purchased has stayed in good shape! My favorite thing is the scarf, but I also love that forest green top (skirt looks really cute with it) & the cardi, which you can dress up or down. The jeans look great on you, but if you think they're too short, I'd return them. And I agree about the other sweater. It also looks like the sleeves are a bit short, though I like my sleeves really long. LOVE the sweater! I have one or two like that and they are my favorite! I think the elbow patch sweater looks great on you! 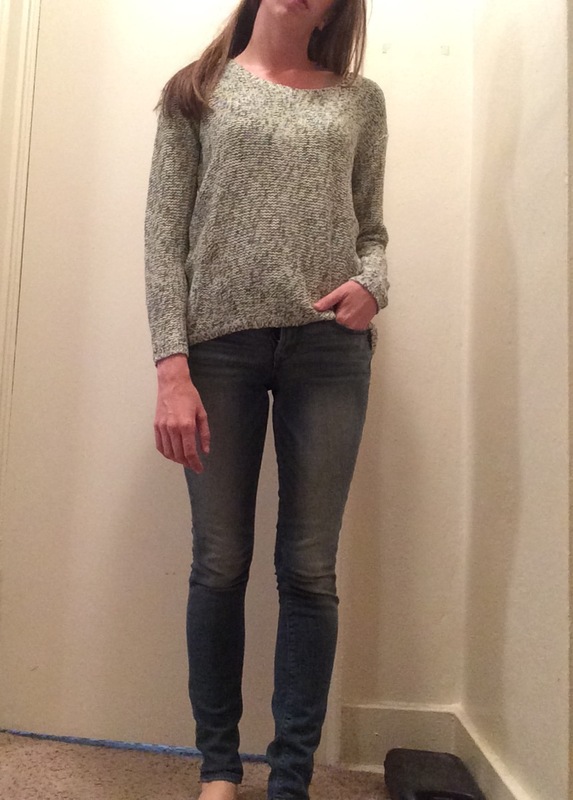 I got the same sweater in my box today so I was trying to see how it looked on others and came across your blog, and I think I'm sold on it now! The sweater looks great! I'm glad you had such good luck with your box!